Are you ready to place your child in a program to build his or her confidence? Do you want a program that will challenge your daughter or son's mind and body? Need help instilling discipline and self-control into your child? If your answer to any of the above questions was yes, then THE EDGE MARTIAL ARTS can help. Visit our school, talk to us, and see the difference we can make in your child’s life. Our Martial Arts Program for school-aged kids will help your child get into better shape, improve coordination, build strength, and become more flexible. Not only that, your child will learn to focus, treat others with courtesy and respect, be humble, and persevere in all circumstances. Your child will be challenged to new heights of excellence in our fast paced classes as he or she learns practical and realistic methods of self-defense. Each class will keep your child motivated, enthusiastic, and ready to excel on the mat as well as at home. 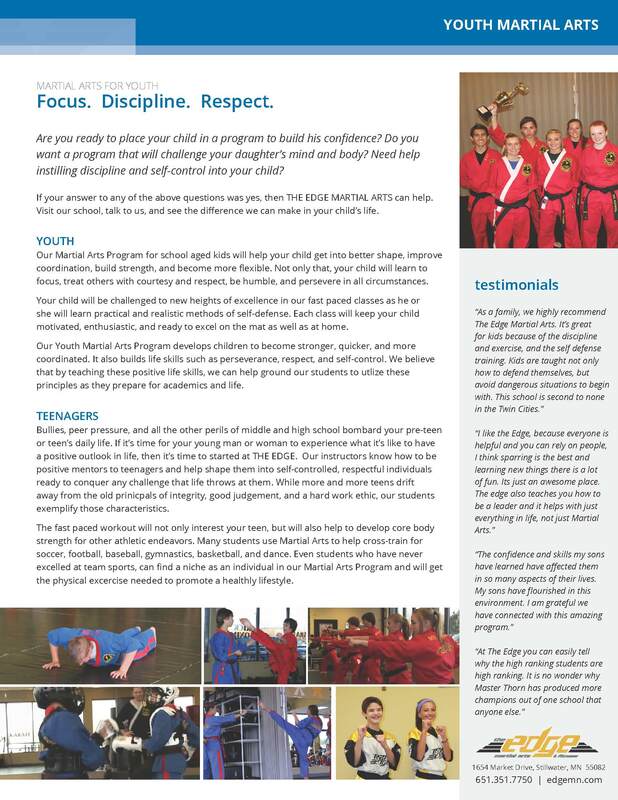 Our Youth Karate Program helps children to become stronger, quicker, and more coordinated, and it also builds life skills such as perseverance, respect, and self-control. We believe that by teaching these positive life skills, we can help ground our students to utilize these principles as they prepare for academics and life.